Kate Green, Markus Deimann and Christian Friedrich co-facilitated the Workshop “Towards Openness: Safety in Open Online Learning?” at #OER17. The workshop took place onsite on Thursday, April 6, 1:45pm – 2:45pm in Seminar Room 2, here is the conference description on the OER website. In groups discuss the provocations and their themes, draw from your personal experiences and choose an area you would like to focus on. Examples for areas could be (but, of course, are not limited to): infrastructure, software, pedagogical practices, social media use in teaching and learning, use of the LMS in teaching (and learning), etc. You can also draw from the resources in our Etherpad with some Campfire Materials. Create a realistic or fantasy intervention, prototype, class, tool, process or even a recommendation that speaks to your area of focus. You can chose whether you want it to be granular and applicable or whether you want to build a device of a utopian (or dystopian) future. Top tip: Think about your audience! If you are looking for some inspiration, visit our workshop site from #OER16 where you will find prototype presentations and some background information. stimuli: what stuck with you? addressed stakeholder group and audience: who are you working / advocating for? 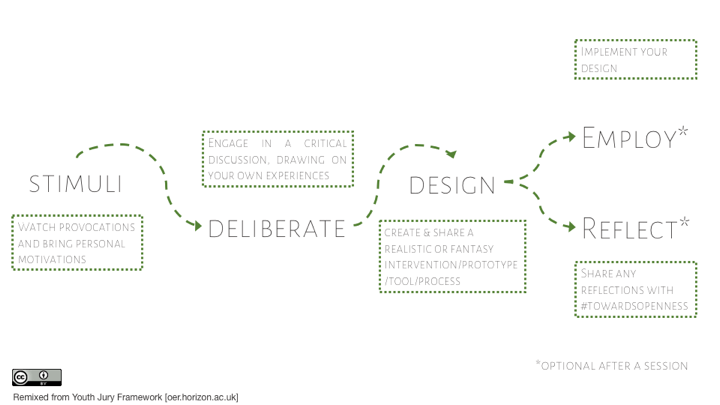 intervention/prototype/concept : what have you come up with, what have you discussed? You are welcome to build on and employ your ideas from this workshop. If you do, please share what you do with us; we would like to share your hard work. You can also share your reflections of the workshop and/or its themes with us using the Hashtag #TowardsOpenness on Twitter. We were Virtually Connecting in a Missed Conversation after our workshop. In doing so, we were aiming to open up the workshop and its conversations beyond the circle of #OER17 participants. Here is the recording of our session. A huge thank you to our guests and participants Ahmed Kharrufa, Yin Wan Kreher, Maha Bali, Chris Gilliard, Kate Green, Frances Bell, Autumm Caines, Christian Friedrich, Jeffrey Keefer and Catherine Cronin.